The Castlevania series has long been one of the most popular and successful video game franchises on the planet. This Konami-developed collection of action games has long chronicled the centuries-old war between the Belmont bloodline and the notorious vampire Dracula. One of the most recent entries in the series, Castlevania: Order of Ecclesia for the Nintendo DS, was released in October 2008. Like other recent DS titles in the series, it features several RPG elements as well as Super Metroid-style exploration, and like those other DS titles, it has well received by fans and critics alike. There’s a good reason for that: the game is simply amazing. The Gothic-style settings and lush environments found in Order of Ecclesia should come as no surprise to longtime Castlevania fans, as the has successfully tapped the Nintendo DS hardware in previous titles Dawn of Sorrow and Portrait of Ruin. As someone who has made this game his first handheld Castlevania experience, however, I was blown away. What particularly impressed me was the fine detail work that was done. For example, the fact that some of the statues in the Ecclesia building have legible writing engraved on them, or that you can see main character Shanoa’s hair and clothing sway in the wind. The character sprites are quite large and animated beautifully, and the artwork throughout the game is top notch. There isn’t a lot in the way of sound effects — a few grunts, groans and clanks here and there — but I’m fine with that, considering that the music is absolutely spectacular, and gives off a Gothic-style vibe that perfectly meshes with the game’s atmosphere. As the game opens, we are treated to a fully-voiced section explaining how Order of Ecclesia fits into the overarching "Belmonts vs. Dracula" storyline. As it goes, people have grown tired of waiting for a descendant of the Belmont clan to save them, and have taken the initiative, creating a series of orders with the goal of researching a way to triumph over the vampiric menace. Most were unsuccessful, but the Order of Ecclesia. Led by a man named Barlowe, this order managed to discover a powerful spell glyph named Dominus thought to be powerful enough to combat Dracula and destroy him once and for all. Shanoa, a member of the Ecclesiastic Order, has been chosen to bear the Dominus glyph, much to the dismay of her partner, Albus. According to Albus, Barlowe had promised him the right to bear the glyph. Outraged, Albus interrupts the inscription ceremony and makes off with Dominus, causing Shanoa to lose her memory and attacking Barlowe in the process. After retraining Shanoa, Barlowe presents her with three tasks. First, find Albus. Then, recover Dominus, and finally, use the glyph to destroy Dracula once and for all. Barlowe claims that Albus was jealous of Shanoa, and that’s why he went rogue and stole the glyph, and her memories and mankind’s hope along with it. But what exactly is Albus up to, and is there more to this story than meets the eye? There’s only one way to find out, and that’s to play the game. Rest assured, the plot will keep you intrigued throughout, although it’s not quite strong enough to carry the game, should you for some reason find the gameplay distasteful. Luckily, there’s little chance of that happening, because the gameplay in Castlevania: Order of Ecclesia is solid and bordering on outstanding. Essentially, things have changed very little since the original NES Castlevania games. What that means is that there will be a lot of running, jumping, exploring levels and battling monsters. The directional pad controls movement and the B-button is used to jump. The glyphs that serve as your weapons during the game are set to X and Y, and alternating the two allows the player to launch combo attacks. Of course, this drains a magic point (MP) gauge which needs to recharge, so care must be taken during battle not to get caught defenseless. There are also certain special moves that can be done by combining different glyphs and inputting special button combinations, though these can only be used when absolutely necessary as they consume hearts. Glyphs can also be used to help you navigate the dungeons and field levels, and these are set to the R-button. Clearly, there are a lot of skills at your disposal, and trust me, you’ll need every single one of them as you progress, because this game is hard with a capital ‘H’! The natural difficulty level of the game will undoubtedly require you to take full advantage of the RPG elements and level up frequently, but it is compounded by a few issues. For one thing, flying enemies can be insanely tough to hit at times, and enemies that "pop-up" from under the ground can be difficult to get away from. Garnish it with a few collision detection issues and you have the perfect recipe for occasional frustration. Thankfully, the issues aren’t all too prevalent or common, but they do happen and it is immensely irritating when they do. On the plus side, though, I welcome the ability to explore multiple locations, and even revisiting them as necessary, and it’s fun messing around with the different glyphs and seeing what kind of attack combinations you can come up with. All told, the gameplay is a worthwhile four-star effort. 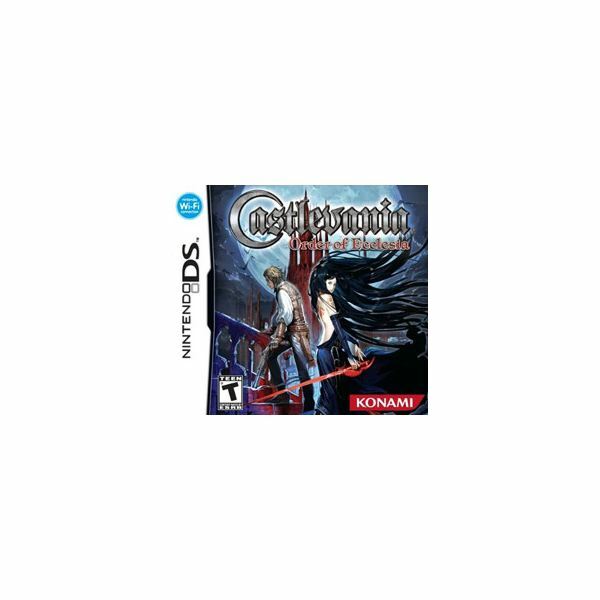 As I said before, this is my first experience playing a Nintendo DS Castlevania title, so perhaps things that are exciting to me won’t be to those who have already played through Dawn of Sorrow and Portrait of Ruin. Nonetheless, I came away immensely impressed by this title, which I must admit reminds me of Castlevania II: Simon’s Quest (my all-time favorite game in the series) to some degree. The audio and visual presentation is excellent, the gameplay is fun for the most part and the story is rather intriguing in its own right. Sure, there are a few issues here and there, but the overall quality of the game is such that they are easily overlooked. Essentially, if you’re looking for an enjoyable action/RPG game with a heavy emphasis on combat and exploration, then by all means, check out Castlevania: Order of Ecclesia.